Our recent pie delivery from Toppings pies featured a wide selection of premium pork pies, however they do also have a range of ‘hot eating pies’ as part of their offering and I was delighted to be able to try some of these, with a big box of their range posted down from Doncaster on Day Three of British Pie Week. I’d heartily recommend you check out the Toppings pies website, which is simply one of the best looking pie company websites I’ve seen (and believe me, I’ve seen a few!) It’s a really high end website, with quality photography and professional design, which portrays the ethos of this high quality, family run business. 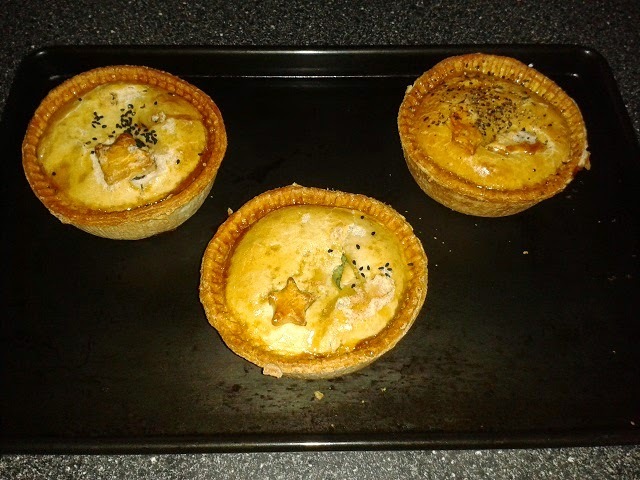 In fact, so much so is this a locally crafted and family run business that the pies are today still made to Maggie Topping’s original homemade family recipes, taking inspiration from the Victorian and Tudor eras! So what of the pies I’m rating today? These hot eating pies come from their Premium range, although there is also a Classic range available. The premium range are priced between £2.70 & £2.90, which I think is very reasonable for a 270g-290g pie and the filling:pastry ratio was pretty spot on for all these pies. The pastry for these pies was very nice, a little out of the ordinary with a rich hot water pastry crust. This provided a lovely flavoursome pastry, crisp but not dry and holding the contents in well without being too thick and chewy. If anything, I think the pastry was the real selling point on these pies and while the content was generally of a good standard, a little tweaking of the filling alongside this quality pastry would see them rate even higher in future! The meat was very nice and tender, with a lovely thick gravy of great consistency for a meat and gravy pie. The minty mushy peas were layered on top of the meat, in quite a clear distinction between the brown meaty layer and green pea layer. The minty pea flavour was a little strong in places in my view, creating quite a distinctive taste to this pie, but perhaps a slightly too stark a contrast. 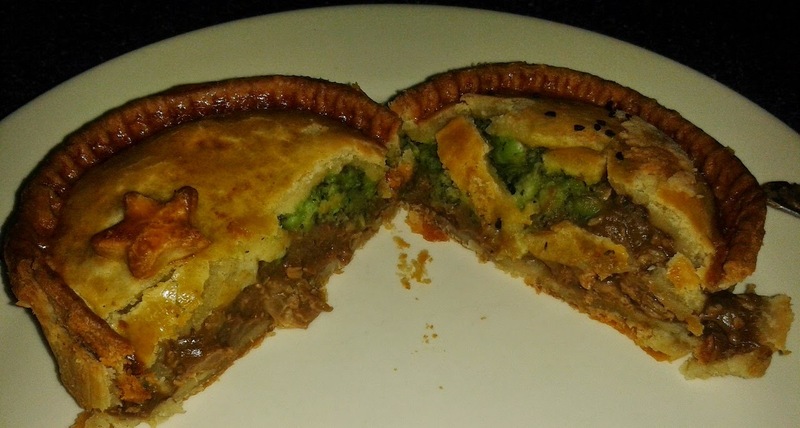 I think I would prefer a straight steak pie rather than the steak and minted mushy peas version, as the steak was very nice and complemented the hot water pastry crust really well. While I didn’t have one of them to sample this time, I’m glad to see this is covered in the Toppings range. While it certainly had all of the above flavours in it, this pie was overly dominated by shallot. It felt at times like I was eating a shallot pie, with such large, uncut shallots present. I’d certainly have liked a more meat base to this pie, as it was definitely shallot heavy and a bit of the meat was a little chewy, which was surprising given the quality of meat in the rest of the pies I sampled. The gravy was a great consistency again and I’d imagine that I probably did not get a typical meat-focused helping of pie here, though I can only rate was it put in front of me! 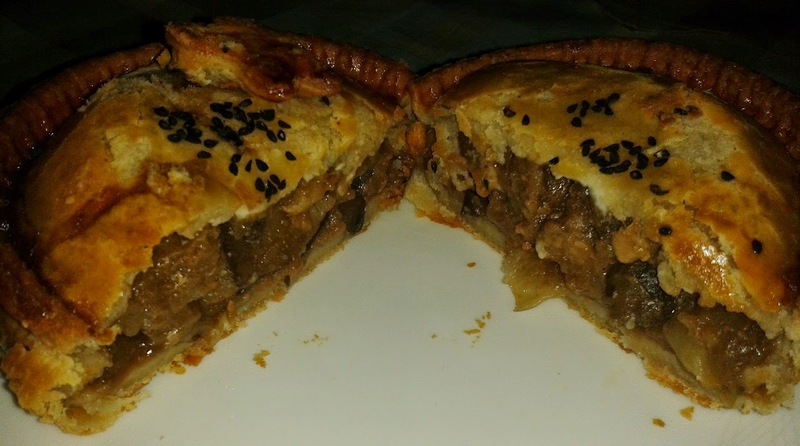 Using chopped up pieces of shallot, rather than large whole ones, would perhaps even out the distribution and help improve the consistency of the pie a fair deal, in addition to the more meaty focus. 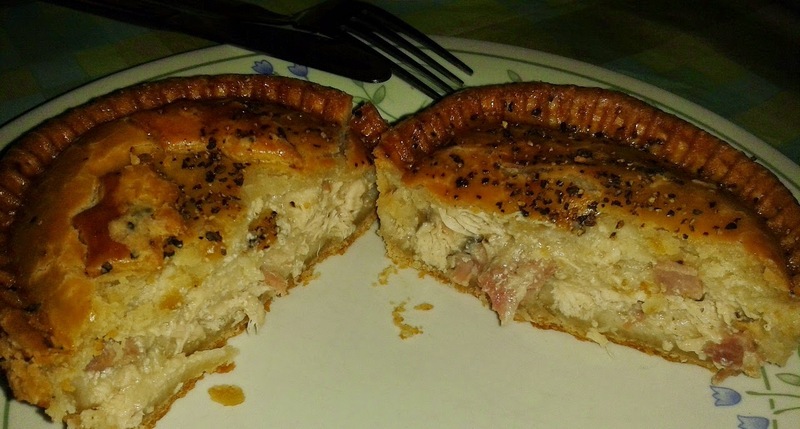 The chicken pie was well filled, with a great capacity of tender chicken pieces and a decent sprinkling of Wiltshire ham to complement it. I did find the sauce quite peppery, a bit too seasoned for my palate but it is what you’d probably expect for a pie sold under the banner of a “creamy cracked black pepper sauce”! Once again this is a classic pie filling done well, with a filling that complemented the delicious pastry once again. In summary, it really is no surprise to me that Toppings Pies have won so many Great Taste Awards, with a clear focus on quality ingredients and pie making. The hot water pastry was delightful and the fillings were generally very good, providing a real quality to the pie eating experience. I can’t go on enough about the quality of their website, which I feel is a real benchmark for how great a pie retailer’s website can be, and hope to sample some more of their range in the future!